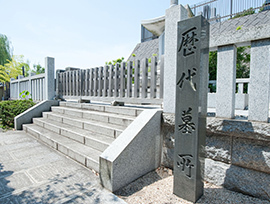 Ikegami Daibo Hongyoji Temple, a Third-rank-Head Temple of the Nichiren Shu Order, is located on the site where Nichiren Shonin, the founder of Nichiren Shu, passed away. 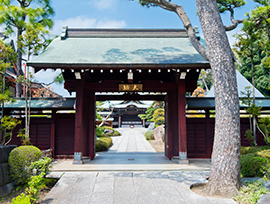 This temple is one of the three holiest sites associated with Nichiren Shonin. More than 700 years ago, on September 8, 1282, Nichiren Shonin departed from his beloved Minobu-san Kuonji Temple (located in what is now Minobu-cho, Koma-gun, Yamanashi Prefecture), where he had stayed for the previous nine years, and headed for Hitachi (located in now the northern part of Ibaraki Prefecture) for hot springs medicinal treatments. Along the way, on September 18, he arrived at the residence of Lord Ikegami Munenaka, Construction Magistrate of Ikegami in Musashi (located in now Ota Ward in Tokyo), who had been appointed by the Kamakura Shogunate. 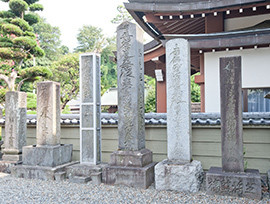 While trying to recuperate at Lord Munenaka's residence, Nichiren Shonin sometimes gave lectures to his disciples and followers on his Rissho Ankoku Ron (Treatise on Spreading Peace Throughout the Country by Establishing Righteousness) in his temporary lulls. However, on October 8, as his condition worsened, Nichiren Shonin designated six disciples (Nissho, Nichiro, Nikko, Niko, Niccho, and Nichiji) to whom the baton was handed over, and on October 10 he completed the distribution of his belongings to these disciples. On the following day, October 11, Nichiren Shonin ordered the then 14-year-old Kyoichi-maru (later Nichizo Shonin) to begin propagation in Kyoto, and had Dai Mandara Honzon (Inscription as the primary object of veneration) hung at the head of his own bed. Then, his last moment came at 8 am on October 13. Nichiren Shonin passed away while his disciples and lay followers were quietly chanting the Lotus Sutra. He was 61 years of age. Legend has it that at that moment, the earth trembled, and the cherry tree in the resident's garden burst into unseasonable bloom. 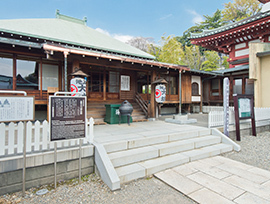 After Nichiren Shonin's passing, Lord Ikegami Munenaka donated his residence to Niccho, who was one of Nichiro's disciples. 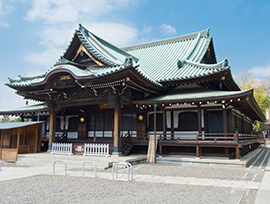 Thus, by making this residence a temple, Choso-zan Hongyoji Temple (commonly called "Daibo") came into existence. 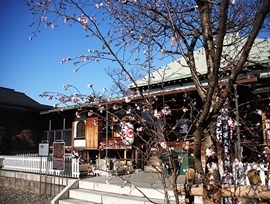 Along with Rikyoin Temple and Shoeiin Temple, Hongyoji Temple is one of among the three branches of Ikegami Honmonji Temple and all three are adjacent to Honmonji Temple. 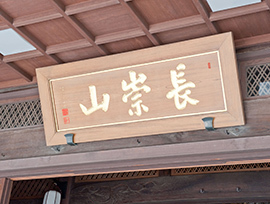 As the sign of being the principal branch among the three, Hongyoji Temple has a red gate at the front, which demonstrates Hongyoji's high prestige. 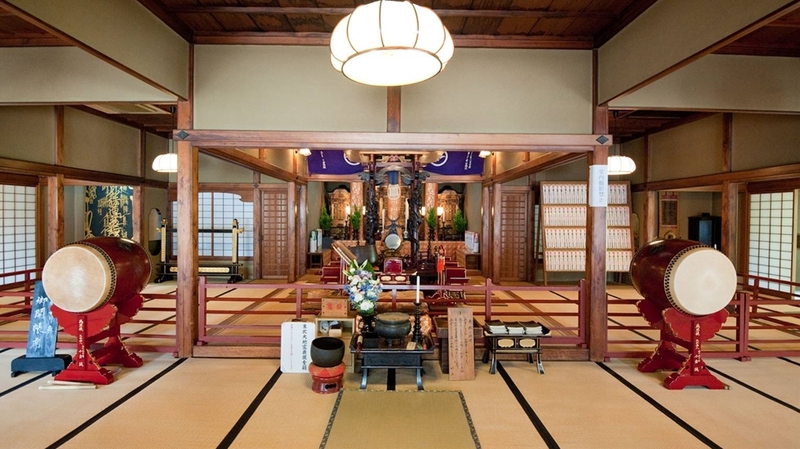 Nichiren Shonin passed away in Ikegami's room containing a Buddhist altar. A hall was built on the site of what was once this particular room. 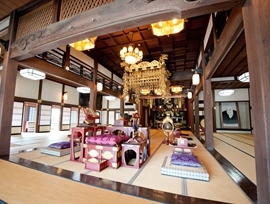 This hall is called Gorinju no Ma (Hall of Nichiren Shonin's Last Breath). 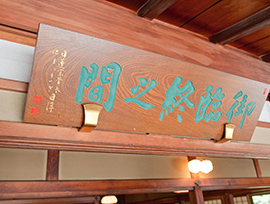 In March, 1936, the Tokyo Metropolitan Government designated the hall as one of its official historic sites. Also, the cherry tree which came into unseasonable bloom still exists on the premises. It is called Oeshiki-zakura (The Cherry Tree of Nichiren Shonin's Passing Anniversary), and usually blossoms in October on the lunar calendar. © Hongyoji Temple. All rights reserved.